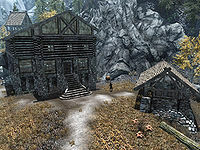 Black-Briar Lodge is a large remote building east of Riften. It belongs to the wealthy Black-Briar family and is inhabited by hostile Black-Briar Mercenaries. During the quest Promises to Keep you will have to break into the house and steal the identity papers for the horse Frost. It consists of three zones. The first is Black-Briar Lodge, which is divided into a ground floor, second floor and a basement. The other two are exterior zones. 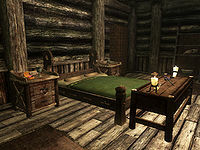 Owned by one of the wealthiest families in Skyrim, the Black-Briar Lodge is huge and spacious, three stories high and with as many entrances, all of them locked with different locks. There are three hostile Black-Briar mercenaries guarding the exterior, and four inside the lodge. All of them carry the key to the three entrances. Once the quest Promises to Keep has been initiated, Frost the horse can be found outside the main northern entrance. Upon entering from the main entrance, a ladder to the right leads to the basement while a table to the left holds a bottle of wine. Across the hallway is an end table with clutter, with a sample of tundra cotton and a bottle of Black-Briar Mead on top. To the right of this table stands a wardrobe with clutter and upper-class clothes and an alcove with a food barrel. To the left is a hallway leading further into the house, past yet another wardrobe with clothes. Around the corner is a huge dining area with a doorway to the north leading further into the house and two ladders leading upstairs to the second floor. On a small table along the northern wall are two bottles of wine and one of alto wine. Underneath the two ladders is a total of four food sacks. The dining table seats six and is dressed with a huge variety of food on display, including four loaves of bread, three potatoes, three cloves of garlic, two salmon steaks, two slices of seared slaughterfish, two grilled leeks, two wedges of eidar cheese, one apple pie, one baked potato, one head of cabbage, one eidar cheese wheel, one goat cheese wheel, one gourd, and a sweet roll. Additionally, the table holds beverages, including one bottle of alto wine, one of Black-Briar Mead, and one of Black-Briar Reserve. 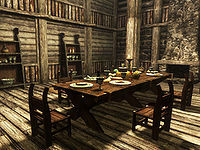 Surrounding the dinner table are several shelves with valuable utensils and more drinks, five bottles of Black-Briar mead, two bottles of wine and one bottle of alto wine. Continuing past the dining area through the entrance to the north will land you in a small storage area where another ladder leads downstairs and two sacks and a barrel all holds food. A door to the east leads to a bedroom with a double bed and even more valuables. In the eastern corner is a dresser with a novice-locked chest containing random items on top. At the foot of the bed is an unlocked chest with random items while the end table next to the bedhead contains only clutter. The wardrobe contains upper-class clothes and a set of shelves holds two loaves of bread, an eidar cheese wheel and a bottle of wine. On the second floor, you can choose between doors to the north and south. The southern door leads to a food barrel and, behind the corner, a huge bedroom. Along the northern wall is an end table with clutter, with the Sneak skill book Legend of Krately House on top. Following the wall, across the small storage alcove, a chest holds some random items while the wardrobe has some upper-class clothes and a chance of a book and some gold. Next to the bed, on another table with clutter, is a Stone of Barenziah. The end table at the foot of the bed has a bunch of lavender on top. Lastly, the southwestern corner has an end table with more clutter, a wardrobe with clothes and some shelves with two red apples. The northern door leads to another dining room, obviously rarely used, with an exit to Skyrim along the northern wall. A small table holds a bottle of wine and, in the other end of the room, a set of shelves holds two bottles of wine and two of alto wine. A novice-locked chest contains random items while the end table contains clutter. A door leads to a storage room with two food barrels, three food sacks, two wheels of goat cheese and a loaf of bread. When entering the basement from the main entrance on the ground floor, check behind the ladder for a locked strongbox with a solid amount of gold. A set of shelves holds five gold coins, a bottle of alto wine, an apothecary's satchel and a mammoth tusk. The next room has an apprentice locked chest with random items and, if you have started the related quest, Frost's Identity Papers on an end table. The door to the north leads to a huge room with an exit to Skyrim and a total of six food sacks scattered around. A Black-Briar mead barrel with up to ten bottles of Black-Briar mead stands against the northern wall, adjacent to a small table with a bit of food, a slice of seared slaughterfish, a loaf of bread, an eidar cheese wedge, a cheese wheel and some grilled leeks. A wardrobe holds some common clothes and two doors leads to two bedrooms with unowned beds. The one on the right contains a coin purse while the one on the left contains an end table with some gold. The last room features a set of stairs leading to the ground floor and a food barrel behind the door. 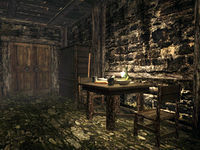 The western part of the room contains a huge desk with a potion of regeneration, some grilled leeks and two bottles of Black-Briar mead. The northeastern corner holds a set of shelves with a huge amount of food crammed together, eight potatoes, three gourds, three loaves of bread, two boiled creme treats, two wedges of goat cheese, two wheels of goat cheese, two green apples, two red apples, a sliced eidar cheese, an eidar cheese wedge, an eidar cheese wheel, and a sweet roll. Behind all the food sits a potion of minor healing and a potion of minor stamina. With the exception of most barrels and sacks, all containers are non-respawning and safe to store items in. Most, however, are owned, thus will mark your items as stolen if you place them inside then remove them. This page was last modified on 21 September 2018, at 01:58.